On the first of May this year, Don looked out a kitchen window and noticed that one of the two Canada geese who’d showed up in our backyard beaver pond had climbed up on the abandoned beaver lodge. This was not unusual; in years past we’ve seen Canada geese occasionally sitting there, apparently liking the vantage point, as they do the top of the rock that sticks up out of the pond, a rock we could walk past before the beaver moved in; now, we’d have to swim. But this goose wasn’t just sitting on the lodge. It poked with its bill around its—er—bottom, fussing with whatever it was sitting on. Don got the binoculars and called to me. We watched the fussing. Was the goose a female, making a nest? We’ve never seen Canada geese stay here to nest. On their return north in the spring, they stop at the pond to refuel and after a few days they flap onward. 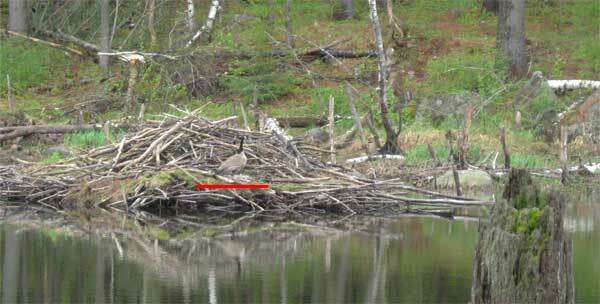 In the following days we kept an eye on the lodge, and on May third we again saw her sitting on what must be a nest. She continued to sit the next day, in the rain. The next day was clear, and at five o’clock that morning I saw her still sitting there, her reflection upside-down in the limpid brown-green water. Three hours later the male appeared, swimming from the west, the direction of the biggest part of the pond, which we can’t see from the backyard because of woods. We were surprised that he evidently was living somewhere over there, not nearer. The female got a breakfast break that lasted about ten minutes, swimming with the male to the head of the little inlet we call Beaver Bay. As she fed along the bank, he swam nearby, apparently guarding. Then together they sat on the rock we call the Preening Rock, where ducks as well as geese like to sit and do their grooming and preening. Then she swam back to the lodge and clambered up to the nest. By now, we were looking for her out the window whenever we were in the kitchen. When we were on the back porch or in the yard she was a constant presence on the lodge. Nature camouflaged her, so we often had to grab the binoculars to make sure that, like the flag, she was still there. Sitting, sitting, sometimes her black neck high, sometimes tucked down. And by now, of course, we had named her Mother Goose. “As we walked down the green riverbank to the green river, one of the swans snarled at us. Jacob opened a bundle, selected a large vinegary chip, and tossed it to the swan. The chip buckled in midair; the two halves plopped into the water. “A civilized distance away from the lock keeper’s cottage, near the towpath we spread our jackets on the wet grass littered with ice-cream sticks and soggy feathers, and while more swans cruised up we sat and threw them their ration of the chips and ate our pieces of plaice. In the drained sky the stars barely glimmered. I hoped a boat would come by and go through the lock. Don and I did some research about Canada geese and learned that they mate for life and that our Mother Goose would be sitting on her nest about twenty-eight days until the goslings hatched. One afternoon, Don saw Father Goose swimming in midpond. Mother Goose flung herself off the nest and flew honking to join him, and all Don could think of, he told me later, was those reunions at airports with wives rushing toward their soldier husbands home from the war. The geese then proceeded to feed and preen. On the afternoon of Mother’s Day, we spotted the pair swimming back to Beaver Bay from wherever else they’d been in the pond. She stepped briefly onto land, while he guarded. Then she returned to her duties. We thought of all the mothers being taken out to dinner. A few days later we saw Mother and Father returning from the western end of the pond, honking and splashing. He climbed up on the lodge near the nest and stood tall, king of the mountain, while she fed at the edge of the lodge. Then she climbed up, laboriously, taking her time. We were reminded of my father’s descriptions of the difficulty of walking on beaver dams to fish from them. After she sat down on the nest and poked around carefully, he went down into the water, swam a bit, lingered, swam off. Come evenings at that time of year, the spring peepers are LOUD, and we would picture her sitting in the darkness surrounded by this lovely racket, the tiny frogs keeping her company. May fifteenth was cold and very rainy. Sheets of rain, gusts of wind, the pond swelling and shimmering. She sat. In the afternoon we saw Father Goose staying nearby in the water while she remained on the nest. We didn’t see her leave it that day and assumed that she couldn’t leave because doing so would expose the eggs to the downpour. The rain continued, cold day after cold day. Father Goose patrolled a lot or sat nearby on the Preening Rock. And she kept on sitting. We feared she would starve. Some sun finally wavered out on the afternoon of May twentieth. Mother Goose left the nest and went off with Father, then returned and climbed back onto the nest. Later, Don saw them both swimming and was surprised that she was taking another break so soon. On the Preening Rock their preening was the most thorough he’d ever seen. She returned to the nest, then immediately jumped back into the pond. She followed Father Goose swimming away. We can only figure that even her determined incubation couldn’t save the eggs from the cold wet weather. Her presence remains in phantom form, and we keep looking over there at the beaver lodge.